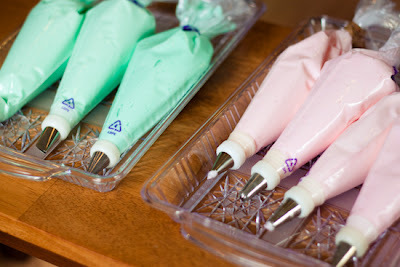 Strawberry Chic: DIY Tuesday: Cake Decorating Party! 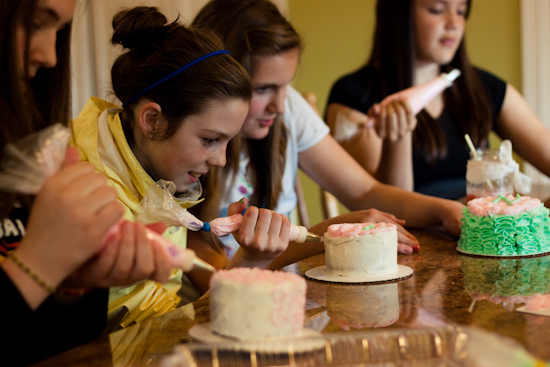 DIY Tuesday: Cake Decorating Party! Earlier this month I was lucky enough to go home to Washington for a visit. It was so nice to see my family & friends...I miss them like crazy! One of my favorite parts about going home is hanging out with my younger sister Natalie. By the time I left home for college, my sister was only about 4 years old, so I have never really been able to spend as much time with her as I would have liked to. So this trip, I decided it would be fun to put together a little party for Natalie and her friends. 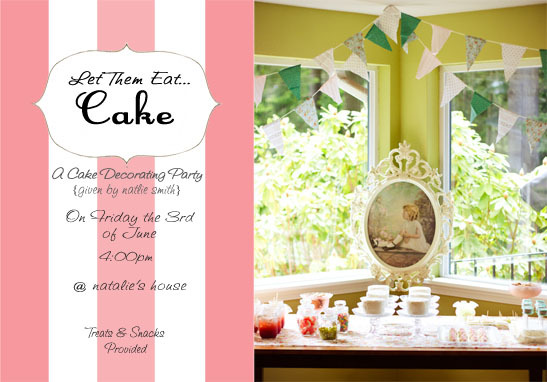 The theme for the party was "Let Them Eat Cake" - An all girl cake decorating party including shabby chic decor, lots of treats & snacks, and of course a personal mini cake and cake platter for each girl to decorate and take home. 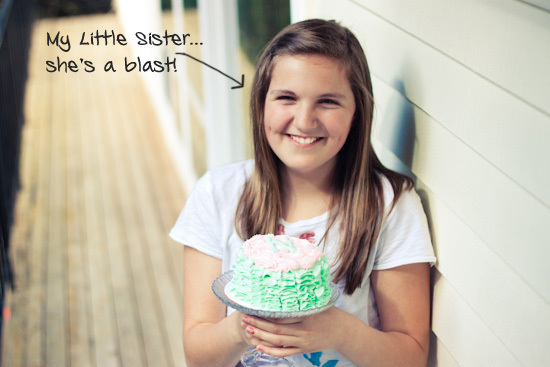 This "Let Them Eat Cake" party theme would be perfect for a birthday, sleepover, back to school party, or just because! First, I let the girls eat their snacks & treats. 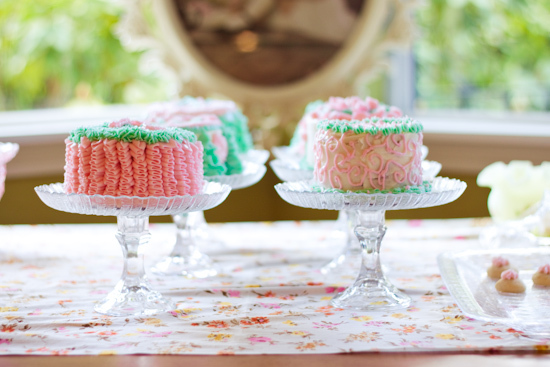 Then I showed them a couple of simple frosting techniques (the ruffle and the rose). Then I let them decorate their cakes however they wanted...they all turned out wonderfully! Read further to get the party details so you can have one too! First off I would like to admit that this party took some time, I owe my Mom and older sister Mel a BIG Thank You! I never would have been able to get everything thrown together without them! 2. Flag streamers -nothing new, but I just can't get enough of them! I used vintage looking scrap fabric courtesy of my wonderful Grandmother. Find the Martha Stewart tutorial HERE. 3. Vintage inspired painting and frame - (I already made with my sister for her bedroom a few years back, I love using things I already have!) Find frame tutorial HERE. 1. 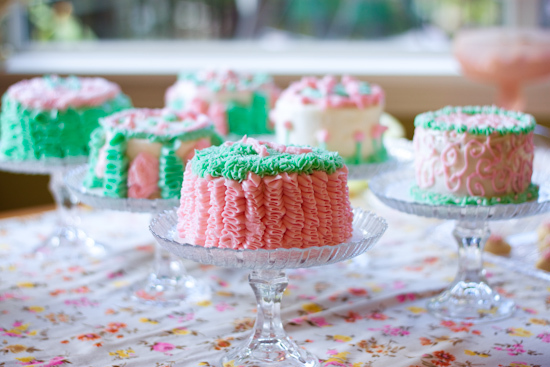 Meltaway's - with dollops of baby pink frosting, get the recipe and tutorial HERE. 2. 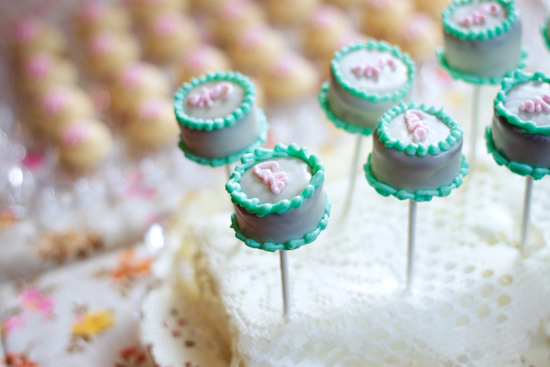 Mini "Cake" cake pops - I made these without instructions...but don't worry I will be posting the tutorial within the next couple of weeks! 3. 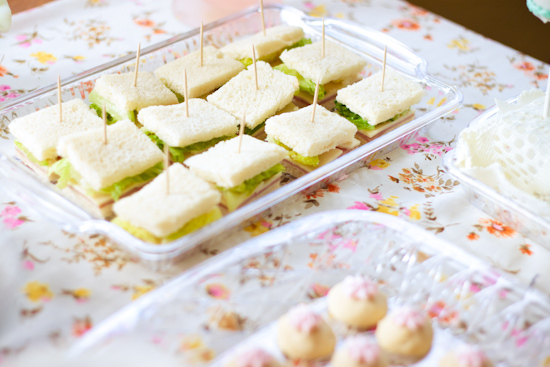 Sandwich squares - Just simple turkey, cheese, and lettuce, cut into squares (with a toothpick inserted). 4. Cheese & crackers - I filled a chic vintage glass jar with wheat thins, cut cheese into blocks, then placed a small cup of toothpicks on the side. 5. 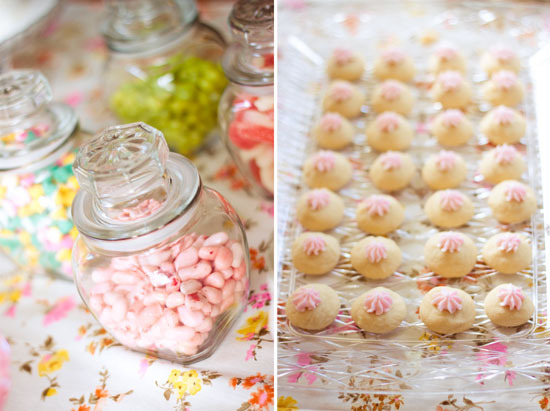 Jars of candy - I bought the candy in bulk at Winco (much cheaper then the specialty candy stores) The small glass jars I used are actually from the Dollar Store! I let the girls eat the candy and use it to decorate their cakes. 6. 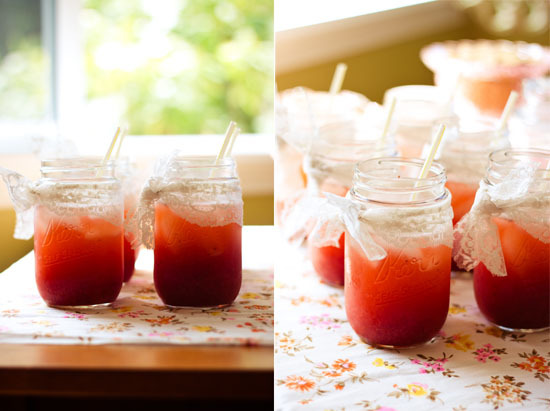 Strawberry Limeade - I used glass canning jars (to keep with the vintage feel) and simply tied a strand of lace to the top. The recipe I used is from "Our Best Bites" find it HERE. I wanted to use some of those fun colorful straws, but couldn't find any on short notice. So, I took a regular striped straw and cut it so I was left with the straight end. 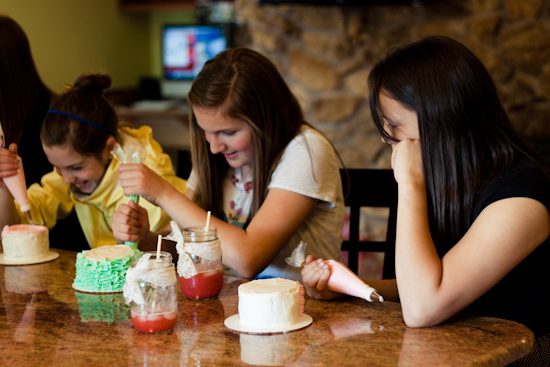 The girls had a blast decorating their cakes, and they all turned out super adorable! 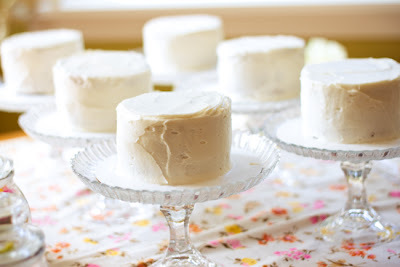 I made the cake stands for only $2 each (get the tutorial right HERE)! 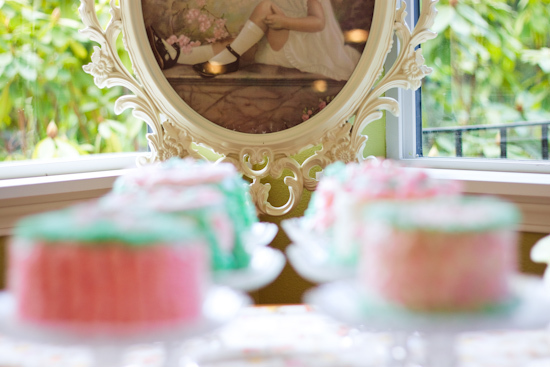 It was great because the cakes provided a themed centerpiece for the table setting and the girls were able to take the platters home with them as a party favor. Before the party, I mixed up a few batches of pink and teal green buttercream frosting. Then I pre-bagged the frosting with various tips so the guests wouldn't have to do this themselves...trust me it can get very messy! Before the girls started decorating, I taught them a few quick frosting techniques found HERE & HERE. 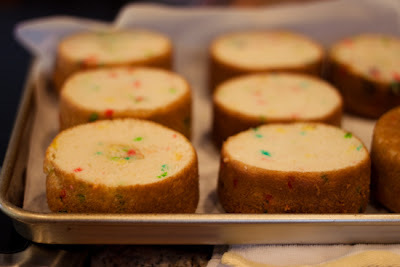 let cool slightly, then cut the tops off so the cakes are nice and level. Step 2. 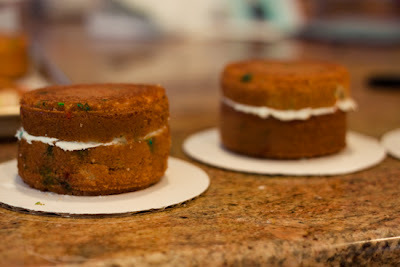 Take 1 whole mini cake, then cut another mini cake in half (fat-ways) with a serrated knife. 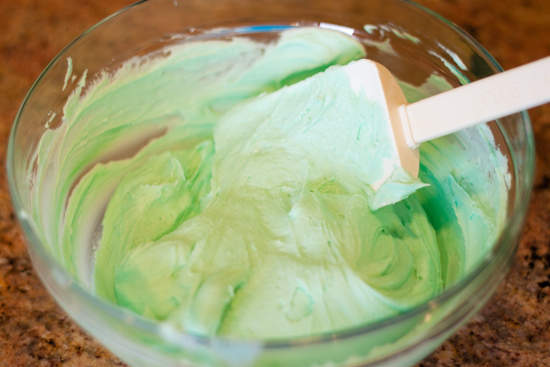 Add a little buttercream frosting to the center of your whole cake, then add the 1/2 piece to the top. Place the cakes on these 6" cardboard platters , so they are easier to move around. Step 3. Depending on the age and skill of your guests, you may need to pre-frost the cakes with white buttercream frosting, or you can do this to save time during the party. Well, I think that's it! If i left anything out, or if you have any questions for me please let me know in the comments or e-mail me at strawberrychicblog@gmail.com! Wow - what a creative bunch - those are all so pretty, and the decor of the party as a whole is gorgeous too! What a great idea! I love your photos!!! I love your blog! This is almost too cute to handle :) I think I am going to adapt this idea for a get together for my bible study, thanks so much for posting this and adding adorableness to my day! i just discovered your adorable blog! thanks for sharing so many cute ideas! What a gorgeous party. 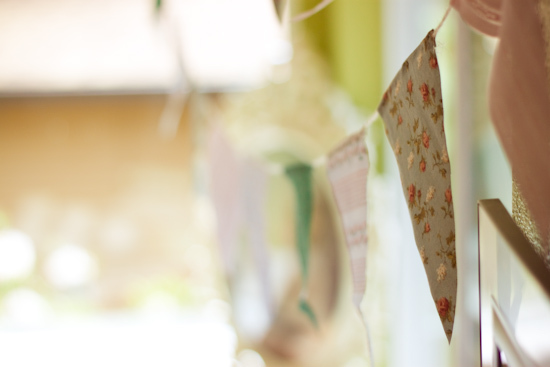 You should become a party planner. This is a fabulous idea... 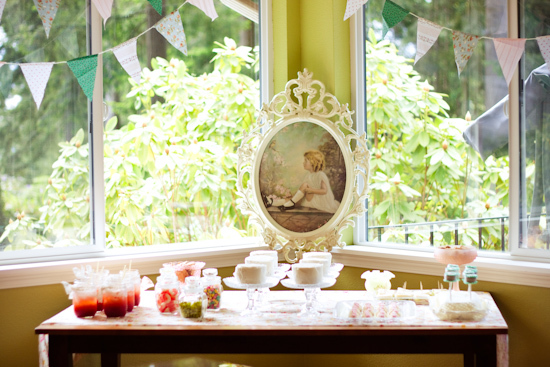 I wish I had done this for my bridal shower! Lovely! Thanks so much for sharing. This is awesome idea. I like your blog and I'll come back to read again dating profiles sale. Upscale Classy parties is a social network for trendsetters and world travelers that started in Upscale Classy parties San Francisco, California in 2009 and has become a global movement in 3 continents with chapters in San Francisco, Sao Paulo, Vienna, and Barcelona. Social & Networking events by Trendy Lime blend Fashion, Travel, Music, Technology, Photography and feature innovative businesses, as well as good cause initiatives. What a wonderful big sister you are! I love the little cakes and the whole party! Beautiful photos!